I think we can all agree that middle school is hard enough without gym class. It's not fun. It's a giant competition, an epic reminder of how NOT athletic you are. The shorts are not flattering. 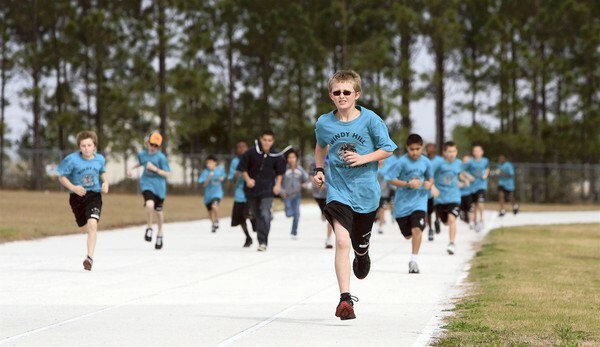 My least favorite part of my eight-grade gym class happened every Tuesday and Thursday: the one-mile run. At my school, you would actually be graded on your one-mile time, which made this an exercise in torture. I never worried too much about getting a good grade or finishing the race in time or anything like that. No, I just flat out hated running. One day, my friend Sean (who was on the track team) said I could run with him if I wanted to, to match his pace and see if I could push myself and get a better time. I told Sean something to the effect of, "I think that would make me die." But Sean, in all of his eight-grade wisdom, said, "Anyone can do it. All you have to do is pick your pace and keep your feet moving. If you start slowing down, it will be hard to stop slowing down." He was actually right. The day I ran with Sean, I ran a personal best. Granted, I didn't run with him again, because, A) he was super annoyed by my constant complaining, and B) I didn't want to work that hard again. The concept that he shared with me is one that we see over and over in life. The hardest part isn't getting started, it's continuing to take next steps. Once you have your destination picked, you have to keep moving forward, keep advancing. Life may be a race, but all you have to worry about is taking it one step at a time, because that's all you CAN do! Eventually, after you take enough next steps, everything looks different and you've moved closer to where you want to be. So, when it comes to your relationship with God, what's your destination? And what's your next step?